Find out more about ELP classes for GSAS students. Visit the International Students and Scholars Office website. As Brandeis University's international student body continues to expand, so does the need to support them linguistically. English Language Programs (or ELP), formerly the English as a Second Language Program, is designed to serve non-native speakers of English. 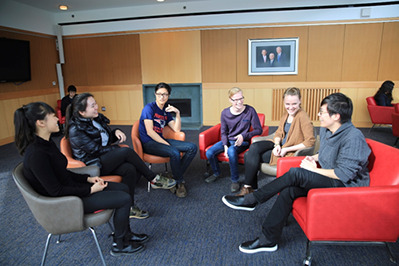 We offer individual tutorial sessions for undergraduates and GSAS students in both written and oral skills as well as intensive English classes and workshops for GSAS and IBS students. These courses and workshops are designed to develop oral communication, analytical writing, and critical thinking skills. ELP works jointly with the Gateway Scholars Program, sharing resources to benefit all English language learners. Please use the links to the left to learn more about program components. You are welcome to contact Sarah Wagner, Program Administrator, with any questions.